UPDATE: The suspect has been charged with five counts of first-degree murder Friday, court documents showed. For more on the latest from the shooting at the Capital Gazette newspaper, click here. 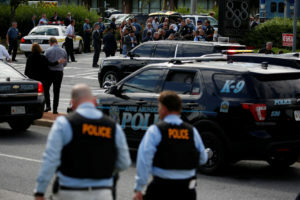 At least five people have died in a shooting Thursday at the Capital Gazette newspaper building in Annapolis, Maryland. The suspect in custody is a white male who used a “long gun,” police said. Police have yet to identify a motive for the shooting. Officials said the shooting took place at a building that houses several different offices, including the Capital Gazette newspaper, which is owned by The Baltimore Sun. Hours earlier, authorities reported an “active shooter” at 888 Bestgate Road, where the Capital Gazette newsroom is located. Gazette reporter Phil Davis told the Sun that multiple people had been shot. In a series of tweets, Davis said a gunman shot through a glass door and opened fire on multiple people. The Anne Arundel County Police did not immediately respond to requests from the PBS NewsHour for additional information. On its official Twitter account, Anne Arundel County Police said the building was evacuated while officers continues to search it. Aerials and TV footage showed people filing outside the building with their hands up. The Bureau of Alcohol, Tobacco, Firearms and Explosives said on Twitter that it was responding to the shooting. As a precaution, Baltimore police arrived at the Sun newsroom for a sweep, reporter Kevin Rector said on Twitter. Maryland Gov. Larry Hogan said on Twitter that he was “absolutely devastated” to hear about the shooting, adding that he was in contact with the county executive, and that Maryland State Police were also on the scene assisting in the investigation. “Please, heed all warnings and stay away from the area. Praying for those at the scene and for our community,” he said. In a Facebook statement, the county executive said the community was “shaken” by the shooting today. “The Capital and the Maryland Gazette are institutions that have served us well for so many years, and I have had the pleasure of working alongside the editors, reporters and photographers,” Shuh said. “Our law enforcement professionals responded swiftly and I thank them for protecting the public by eliminating the threat and taking the suspect into custody. Our thoughts and prayers are with the victims and their families,” he wrote. A New York Police Department spokesman confirmed to Jon Swaine of The Guardian that officers have been dispatched to headquarters of several major media organizations in New York, following the shooting in Maryland. President Donald Trump, who was in Wisconsin earlier today, tweeted that he was briefed on the Maryland shooting. “My thoughts and prayers are with the victims and their families. Thank you to all of the First Responders who are currently on the scene,” he wrote. PBS NewsHour will update this story as it develops. The NewsHour’s Dan Cooney contributed to this report.